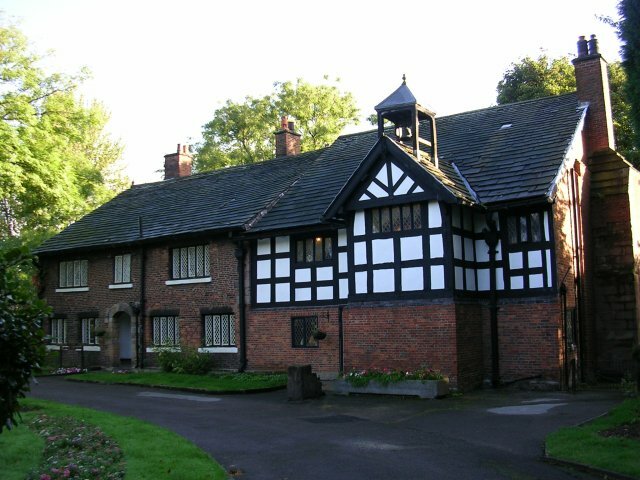 Clayton Hall is a medieval manor house with its own tram stop. It has a wonderfully romantic half-hidden past. Extensive land in the area was granted to the Clayton family by one of the de Grellys who were Lord of the Manor from the early 12th century. I don’t know why this was ‘granted’ but knowing the right people has always been important. Maybe the Claytons were at a networking event on Deansgate; this is still works for many aspiring businessfolk from around ‘ere. Cecilia Clayton married Robert de Byron in 1194 taking the old place into that family who centuries later produced the mad, bad and dangerous-to-know Lord B, the romantic poet. The Byrons were here for more than 400 years but little is known about their lives. They sold the buildings to the Cheetham brothers, George and Humphrey, in 1620 for £4,700. Humphrey went on to found Chetham’s school, originally for poor boys, and Chetham’s Library, the oldest free library in the English-speaking world which does have Victoria station nearby but not its own tram stop. There is only a remnant remaining of the rebuilt 15th century house that was probably constructed around a quadrangle. It has been messed about with something shocking over the years with bits added and lost by different owners and renters. This was mostly in the days before schedules, listings and the eagle eyes of ‘you can’t do that, you are destroying my heritage’ social media. Despite all this, the ancient feel of the place is unmistakable. Here is treasure, well, historical treasure anyway. It has a moat. On the next stop up from the Etihad Stadium with all that Middle Eastern oil-money, investment-potential, adrenaline-fueled, into-the-future machismo is a moated manor house. With a moat. Only in Manchester could these worlds collide. And did anything else happened close by? Many medieval manors had their day then sank into pastoral oblivion. Not here. The Industrial Revolution exploded alongside the old place. Bradford pit, Johnson’s ironworks, cotton mills and Calyton Analine sucked people in from all around and east Manchester boomed. So much happened that the old Hall just got forgotten. Not quite oblivion, more slipping into a coma. But Clayton Hall has friends. The Clayton Hall Living History Museum has done wonders with this half-forgotten half-timbered gem. They could do with both encouragement and help. If you live nearby you can call in to the Memory cafe (first Monday of the month) or come along to one of the many events including Halloween and Christmas decorations extravaganzas. If you’d like to volunteer with the group you can get in touch via their website http://www.claytonhall.org/. Or you might like to try your hand at uncovering the past. There is so much unknown about Clayton Hall, so much yet to be uncovered. It could be you that uncovers the story about the ghost (surely there must be a ghost!) or the truth about whether Oliver Cromwell really stayed here (there are rumours but no proof- yet). We know a lot about industrial Manchester but very little about the centuries that lead up that great leap forward. Where are the historians who can fill the many gaps in the unknown story of one of Manchester’s oldest and most enigmatic sites? Whether you fancy a cuppa and a chat, a practical bit of decorating, historical detective work or just an interesting visit this place is a little gem on our own doorstep. And Clayton Hall even has its own tram stop.